It’s been scary and unfamiliar, but with the help of good exposure, dedicated mentors and his own persistent streak, Southern Illinois University Edwardsville Upward Bound Math and Science student Dierre Littleton is forging a successfully scripted path for his life. “When I first started college, I vividly recall feeling like this was not the place for me, or that I was not properly prepared to take on higher education,” said Littleton, who is working on his doctorate in higher education administration (PhD) at Saint Louis University, courtesy of a tuition remission for faculty and staff. Littleton began working July 5 at SLU as a residence hall coordinator for Spring Hall, which holds more than 500 students. He is responsible for the building’s logistics, maintenance, student conduct and programmatic issues. Littleton earned a master’s in college student personnel services and administration at University of Central Arkansas and a bachelor’s in communication: public relations from Indiana State University. Throughout his college career, Littleton has maintained a 3.5 grade point average or higher. Upward Bound also exposed him to the process and techniques of applying for college scholarships. It was this experience, coupled with Littleton’s academic prowess that earned three college scholarships. He received the Presidential Scholarship to Indiana State, which covered tuition, fees and room and board. University of Central Arkansas also gave Littleton a full ride to attend its school. The ESLC manages three TRIO Upward Bound Programs, which are administered, funded and implemented by the United States Department of Education. TRIO Programs serve low-income individuals, first-generation college students and individuals with disabilities to progress through post-baccalaureate programs. Littleton is looking down the road to the day he will become president of a college campus. His desire to become a college president was nurtured by Dr. Daniel Bradley, president of Indiana State University. It’s going to take good role models, mentors and a strong belief in yourself to accomplish great things, explained the East St. Louis native. The SIUE Upward Bound Math & Science program is designed to prepare participants for post-secondary education and motivate their exploration of science, mathematics and related education professionals. Participants receive tutorial instruction in science, technology, engineering, math (STEM), along with language arts, foreign language and more. The program also offers a six-week summer residential component, where University faculty members instruct introductory courses in STEM, language arts, foreign language and computer literacy. 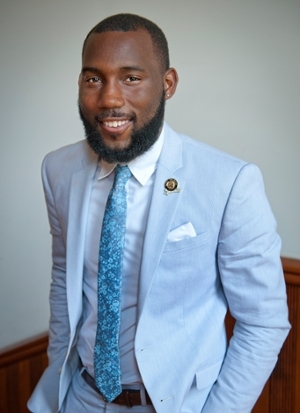 Dierre Littleton is a former SIUE Upward Bound Math and Science student who is working on his doctorate in higher education administration (PhD) at Saint Louis University.